If you have develop your own shopping cart and need split settlement manual integration by yourself, here are the details. The API allows you to split the settlement for the transaction to multiple merchant instead of only 2 when using split settlement product. 3. Then you will need to fill in the return URL. This is the URL where senangPay will redirect the buyer after the payment has been processed. 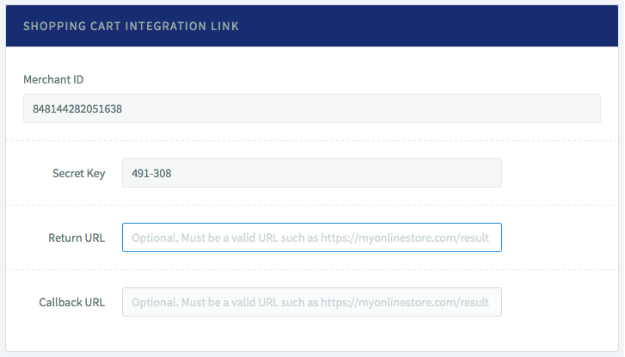 If you already had set the return URL for your manual integration API, then you can skip this step. 4. Next, you need to fill the Callback URL. Callback URL is used as alternative notification to merchant shopping cart in case there is a breakdown in transaction flow. For more info on Callback URL, read here. If you already had set the Callback URL for your manual integration API, then you can skip this step. amount The amount to charge the buyer. The format must be in 2 decimal places. Example 25.50.
hash The is the data to ensure the data integrity passed from merchant’s shopping cart to senangPay. Refer to How to generate the secure hash section for more info. split_settlement This is a string containing the split settlement information. The string should follow below format. The split_amount should be the split amount multiply by hundred, not in percentage. Merchant can split the total amount to unlimited merchant account, as long as each merchant account (including owner) amount is RM 2 or more. Merchant ID must be ID of active senangPay account. No space or symbol allowed. Merchant (transaction owner) will be allocated RM3 from the transaction. Merchant 1544436524 will be allocated RM2 from the transaction. Merchant 1677765432 will be allocated RM3 from the transaction. Merchant 1766653212 will be allocated RM2 from the transaction. Can I just add split settlement parameter in my existing manual integration API setup? Yes. You can enable split settlement by adding the split_settlement parameter, and include the parameter in your hash. For your reference, please refer to this sample code. Kindly please download from here.